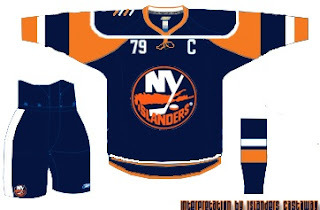 Remember those frightening mock-ups we first saw a while back for the New York Islanders? The image on the left should jog your memory. It's scary. Then somebody put that into a jersey template which turned out like this. And it didn't leave any of us feeling any better about it. Well anyway, I was surfing around yesterday and came across something that appears to substantiate that blurry photo. 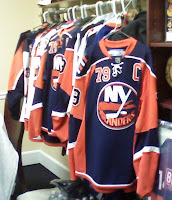 But again, we don't know anything for sure as the Isles have yet to make any sort of official announcement. It looks to me like one of those moon bounce things kids play on at church carnivals and the like. 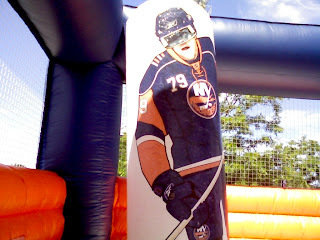 Inside it is a painting of a giant New York Islanders player (#79, Yashin?) wearing a jersey with a new style — one that looks an awful lot like the jerseys in that photo. So take that photo for what it's worth. The person who posted it said he saw it at Stony Brook University. For more on that, go here. By the way, I found another template designed based on that infamous photo above over at Islanders Castaway. That's all I've got for the Isles today. Thoughts, comments?